The Sony DSC-W170 is the latest addition to Sony's Cyber-Shot W series of digital still cameras. The Sony DSC-W170 features a 10.1 mega pixel and a Carl Zeiss 5x optical zoom capable of wide angle views of 28mm-140mm and 30mm-150mm. The Sony DSC-W170 also has a 2.7 inch LCD screen and an eye-level viewfinder. 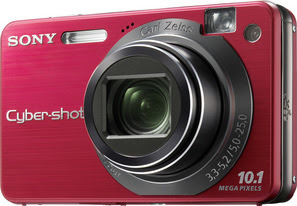 For the style conscious, the Sony DSC-W170 will come in sophisticated champagne, red, black and silver colors. Another new feature which was not previously available in the Sony Cyber-shot W series is the smile shutter mode which will automatically capture your subject when they smile. This is a great function to use when taking pictures of your grumpy toddlers. The Sony DSC-W170 is the perfect camera for those who don't know about camera settings, etc. The Intelligent Scene Recognition would let the camera automatically select the optimal settings for better picture quality. The Sony DSC-W170 can also playback your images in full 1080p resolution by connecting it to your HD TV via HD component input. I don't get the improved face detection technology on the Sony DSC-W170. According to Sony's press release, you can select between child priority or adult priority and the camera will automatically detect the faces and optimize exposure, focus, etc. I mean, I get what a regular face detection technology is for, but why prioritize between a child and adult? I can only think of one class of persons who might find this technology useful--pedophiles. I mean, come on! Do you really need that function on the Sony DSC-W170, let alone ANY camera? The Sony DSC-W170 will be available in April for $300. A comment on your "odd feature" section... First, the reading I've done (mostly from the Sony website) has listed the adult/child priority feature as part of the smile recognition function not the face detection function. Given this, it makes perfect sense. Consider taking a picture of a mother and child. Of course the mother smiles all the time while you dance around trying to get the baby to smile. Without the ability to know the difference the camera goes and takes a picture right away because it sees a smile on the mother. With the feature, you set the priority to child and it ignores the mother's smile until the baby smiles. Don't care if the kids smiles? Set priority to adult and it snaps when mamma starts paying attention and smiles. Well, the press release I've encountered says it's only face detection and not smile detection which I thought was weird, that's why I said why is there a need to detect between an adult face and a child's face. If they have said that it's incorporated with the smile detection, that I would have understood. But thanks for clearing that up. when is boobie detection going to be invented?